"Hydropower is the most efficient means we know of to convert energy into electricity ." " Removing a dam removes several hundred megawatts of power from the grid — power that must be replaced by another energy source." Like all energy sources, hydropower projects have an impact on the environment. Comparing hydropower with the alternatives, however, helps put it in perspective. 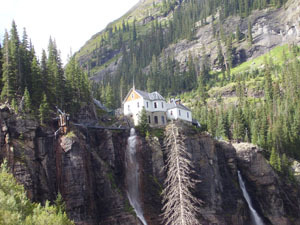 Bridal Veil Falls hydroelectric plant in Colorado. It began producing electricity in 1904, was decommissioned in 1954, and restored to service in 1990. As with wind and solar power, hydropower is fully renewable, 100% clean, green energy. It consumes no natural resources, produces no emissions, and creates no waste. It is not our objective here to talk you out of solar and wind as viable energy sources; they play important roles in our energy future. But when the wind stops blowing and the sun goes down, hydropower systems continue to generate electricity. And, unlike solar and wind systems, hydropower projects have repeatedly paid for themselves without requiring government subsidies. Hydropower is the most efficient means we know of to convert energy into electricity. Typically 85%-95% of the energy in water is converted to electricity, compared to 15%-20% for PV solar, 35%-45% for wind, and 30%-45% for coal. Combined with an ongoing fuel cost of zero, it becomes clear why hydropower is the least expensive technology for generating electricity today. In other words, hydroelectricity is an extremely efficient, clean, inexpensive way to produce electricity. 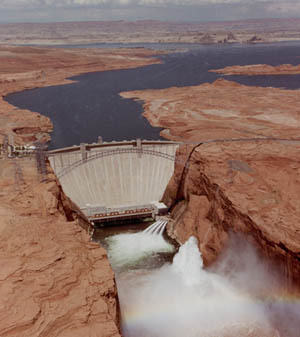 Glen Canyon Dam and Lake Powell on the Colorado River in Arizona. If size matters, then the ecological footprint of a large Reservoir system is significant. Dams are often hundreds of feet tall, and the resulting lakes can stretch for miles up canyons and valleys where rivers once ran. Some of the early dams were constructed without much concern for fish migration, effectively blocking passage from lower waters into the spawning grounds upriver. The fish problem, in particular, has been the catalyst for the entire removal of some dams. More existing dams are currently being considered for removal. Before we demolish a dam, we should consider where the power will come from instead. Removing a dam also removes several hundred megawatts of power from the grid — power that must be replaced by another energy source. Since 90% of our power comes from fossil fuels and nuclear, it’s easy to guess what the alternative might be. Another consideration is the upfront cost of building any type of generating facility. With existing dams, those costs are already behind us; we are paying for only for the electricity produced (and the fuel is free). Perhaps there is a better way to solve the problem.